Fleas are a real nuisance to your cat. Not only are they itchy and irritating, their bites can develop into nasty sores. Flea bites can also result in hair loss and dermatitis, both of which require veterinary attention. In some cases, your cat can also contract diseases from these pests. It is no surprise that flea prevention should be a priority for all cat owners. There are so many treatments on the market today, such as drops and pills, that flea collars seem to have lost the popular spotlight. However, they are a very effective solution to eradicating fleas from your cat. They tend to last much longer than other treatments - some of which have to be used on a monthly basis. In this article, we take a look at the best flea collars for cats, how they work, and how to use them. Can Kittens Wear Flea Collars? Choosing the right flea collar for your cat is an important decision. There are many considerations involved in selecting the perfect collar for your furry friend. At the very least, you want to be sure the collar is both effective and safe. Common ingredients found in flea collars include Amitraz, Pyriproxyfen, Propoxur and Deltamethrin. Others will use a variety of essential oils as a chemical-free alternative. Avoidance of certain ingredients is recommended. For example, the insecticide Tetrachlorvinphos (TCVP) is believed to pose a risk to both pets and people. Some collars, especially those available online, may still contain this chemical. The type of protection offered by a flea collar is an essential choice. Depending upon the ingredients, a flea collar usually either kills or repels fleas. Pesticidal collars generally kill fleas, while those which use essential oils act more as repellents. In some cases, collars will do both. Fleas are the main target but most collars will repel ticks, lice, and other parasites, too. Whichever option you prefer, the length of time a flea collar provides protection can vary. Some collars are able to provide protection for as long as 8 months. These can make an easy and convenient choice for busy pet owners. Other collars will need replacement more frequently. If your cat takes a little time to get used to a collar, it is best to opt for one which is longer-lasting. Aside from the hassle-free factor, a more durable collar is cheaper in the long run. Flea collars are designed to be continuously worn for at least a few months at a time, before being replaced. Because they stay on your cat during all their adventures, it is crucial that they fit properly. Many collars are one-size-fits-all, but will need to be correctly adjusted and trimmed before fitting. If you have a very small or large breed of cat, you may need to get a recommendation from your vet. It is vital that your flea collar includes a safety clasp which will snap on and off, should your cat get trapped. Cats are known for squeezing into small spaces and exploring. If the collar gets snagged on a branch or wire, your cat needs to be able to escape without injury. Lastly, a water-resistant flea collar is imperative if you have an outdoor cat. Luckily, the best options are almost always water-resistant. This means your cat can get caught in the rain and still remain protected from fleas. Choosing the best flea collar can be confusing. There are many different options on the market, all competing for your attention. When deciding on a flea collar, it is very important to do your research first. In this section, we show you four of the best flea collars for cats to make your choice easier. The MATENIX Flea Prevention Collar uses natural essential oils to effectively repel fleas. This makes it a great choice for owners who would rather avoid the use of pesticides. 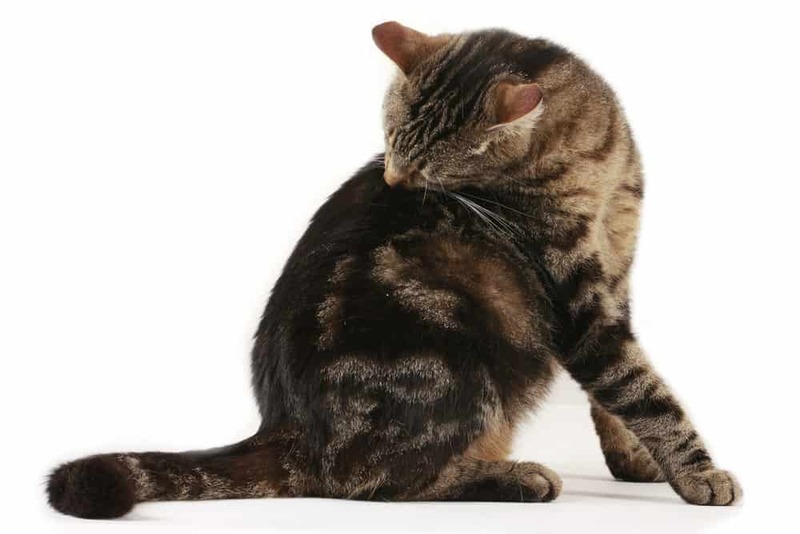 After a few days of wear, any fleas that are present on your cat will vacate - leaving your cat free from irritation. The collar is designed to fit all cats. Simply fit the collar to allow for 2-3 inches of strap past the buckle and trim any remaining off. The MATENIX Flea Prevention Collar provides protection against fleas, ticks, and lice for 8 months. The collar is completely waterproof - so even if you bathe your cat, you will not lose any repellent effects. MATENIX Flea Prevention Collar is so confident in their products they offer a money-back guarantee. Should you not be happy with this collar for any reason, you may return it within 60 days for a full refund. The TORRIX Cats Flea Collar For Cats is another collar which utilizes natural ingredients. It uses the essential oils of lemon, eucalyptus, and lavender to repel fleas. This collar is suitable for cats and kittens from 10 weeks old. It also protects against ticks, which can spread diseases to your cat. Just like the MATENIX collar, the TORRIX Cats Flea Collar will defend against fleas for up to 8 months. The collar can be adjusted to fit almost all sizes of cat. The minimum collar circumference is 7 inches, while the maximum is 13 inches. The collar is water-resistant, non-toxic and safe for humans. Some customers have mentioned the collar has a particularly strong smell. If you or your cat find this smell unpleasant, simply leave the collar to air for a few hours before fitting. The Prunno Flea Collar For Cats claims to defend against 500 different kinds of parasites. The primary ingredient is citronella essential oil, which is well-known as an effective and natural insect repellent. Fleas despise the scent of citronella, so they will leave your cat’s fur quickly. The collar is only available in one size - but with a maximum length of 25 inches, it can easily be trimmed to fit most cats. The scent isn’t overpowering and is inoffensive to pets and humans. A stand-out benefit of this collar is the inclusion of a safety-release mechanism. If your cat is the adventurous type, you can rest assured they will be safe, should they get snagged. Furthermore, the Prunno Flea Collar For Cats is 100 percent waterproof and will provide complete protection even if it has been submerged. The Melkaart Flea and Tick Collar for Cats is the only one on our list which uses pesticides in their formula. It contains the chemical Flumethrin at 4.5 percent and Imidacloprid at 10 percent. These chemicals will kill 95 percent of the flea population on your cat in only 24 hours. This collar keeps the pesticides safely contained, releasing them gradually over time. This means there is no risk to you or your pet. The collar is also free from any offensive chemical odor, which can be off-putting to some people. In line with the other collars on our list, the Melkaart Flea and Tick Collar for Cats features adjustable sizing. Therefore, it is suitable for all kitties, big or small. It is water-resistant, but shouldn’t be submerged as it will lose its potency. This collar is effective for up to 8 months if used correctly. Flea collars work in one of three ways - emitting toxic gases which kill fleas, secreting pesticides onto the skin, or repelling parasites with strong-smelling substances. The first method is not always effective across the entire body. Rather, it simply serves to push the fleas away from the neck to other areas. More effective collars use a combination of essential oils which are very unpleasant to fleas. The most efficient collars utilize a variety of different chemicals, all of which work to kill fleas fast. To truly understand how your flea collar works, you must examine the ingredients. The method of action and level of effectiveness will vary, depending upon the formula used. Below, we take a look at the most common ingredients found in flea collars. Pyriproxyfen is a form of insect growth regulator (IGR). It has been registered as a pesticide with the Environmental Protection Agency since 1995. Insect growth regulators work by mimicking insect hormones and interfering with their natural development. They are effective at stunting growth in flea eggs, larvae and pupae, but do not kill adult fleas. This pesticide is used in combination with other chemicals which kill adult parasites. They are designed to put a stop to any resurgence of fleas which are developing in the home. Pyriproxyfen is very widely used, being found in over 300 pesticide products. Propoxur is a form of carbamate insecticide which attacks the nervous system of parasites. It can also affect the nervous system of mammals, fish and birds - so it should be used with care. It blocks the action of an enzyme which transmits signals from the brain to the muscles, paralyzing the victim and resulting in death. Propoxur works fast. The majority of pests residing on your cat will have died within 24 hours of being exposed. This pesticide can be very toxic to humans. So it is crucial that you follow the directions very carefully when using a product containing Propoxur. Flumethrin is a type of synthetic pyrethroid pesticide. It is frequently found in products designed to defend against parasites. The effect depends on the concentration which is used. If applied in a low concentration, it creates hyperactivity which causes eventual death. If applied at a higher concentration, parasites become paralyzed and die faster. The chemical spreads gradually from the application site over the course of a few months. Usually, because fleas move across their hosts, the majority of fleas will be exposed and killed within a few days. Flumethrin is also effective at killing and repelling ticks and larvae. Imidacloprid is an insecticide which has been designed to mimic the chemical makeup of nicotine. Nicotine is found naturally in many plants, not just tobacco. It is toxic to insects, acting as an effective repellent in the botanical world. When applied to animals, 100 percent of fleas are killed - most within the first 20 minutes. The effect lasts around four weeks before a further application is required. This insecticide is very efficient at targeting insect pests - so it is safe for use on mammals. It is very widely used, being included in around 400 products sold in the US. It has been available for purchase in the US since 1994. Once presented to the skin, imidacloprid sinks into the lipid layer of oils which are naturally secreted by the skin. It also descends into the hair follicles. Imidacloprid doesn’t become absorbed into the bloodstream or skin layers. Because imidacloprid mixes with the oils on the skin, it is naturally spread across the whole body. This usually takes place within as little as 12 hours when using a flea collar. Imidacloprid is water-resistant once it has become suspended in skin oils. This makes it durable against the impact of rain or full submersion. Imidacloprid kills parasites by binding to their nerve cells. The nervous system is broken down, causing their internal systems to quickly fail. Amitraz is a form of non-systemic acaricide, which means it is designed to target ticks - although it is also effective against fleas. It was created in the United Kingdom by the Boots Company in 1969. Amitraz interferes with receptors in the nervous system of the parasite, which leads to paralysis and rapid death. This chemical is not harmful to mammals in the same way it is to insects. For this reason, it is frequently found in pet products. If used in combination with other chemicals, Amitraz can be useful in preventing future infestations. It is also found in flea sprays as well as flea collars. Essential oil flea collars are a popular alternative to pesticide products. In the past, there was controversy regarding the risks surrounding the use of pesticides. For example, in 2009, the Environment Protection Agency concluded that there were many reports of sickness caused by flea treatments in recent years. This prompted for more informative product labeling and guidelines to be included with these products. But these concerns have stuck in the memory of some consumers. Flea collars can feature a variety of essential oils. Those commonly used are citronella, eucalyptus, lavender, lemon, cedar, and rosemary. Some essential oils will kill fleas on contact, but the greater majority work as simple repellents. Fleas intensely dislike the smell and taste of essential oil, and will take rapid action to avoid them. Kittens are extremely vulnerable to the dangers of both fleas and the treatments designed to eliminate them. Fleas must feed multiple times a day in order to survive and breed. Kittens have a very small body mass, which does not contain much blood volume. If kittens are exposed to a severe flea infestation, they can lose too much blood to fleas and die from anemia. If a kitten has pale gums, you should seek veterinary help right away. Fleas can also transmit parasites like tapeworms, which are much more threatening to the health of kittens than adult cats. Kittens cannot withstand the weight loss and malnutrition caused by tapeworms at their young age. Therefore, treating fleas on a kitten is incredibly important to preserve their health and survival. The method by which you treat fleas on a kitten has to be carefully considered according to their age. Kittens are very sensitive to flea treatment products and can be poisoned if an incorrect treatment is used. The general advice is that kittens should not use any flea treatments before they reach 10 weeks old. However, this advice is based upon the normal development of a kitten and adequate body weight being reached. There may be cases where a kitten is a little underweight for its age and is not yet strong enough for treatment, even at 10 weeks. The best course of action is to speak to a veterinarian if your kitten has fleas. This applies to natural treatments as well as pesticides. Essential oils can be toxic to kittens. Once you have chosen the perfect flea collar, you need to ensure you are using it effectively. Otherwise, you and your cat are going to continue suffering the effects of fleas. There are a number of things you should be aware of when using flea collars. We will go through them in this section. The first and perhaps most obvious consideration is the fit. When choosing a collar, you must make sure that it is neither too tight or too loose. You do not want to constrict your cat’s neck, but the collar must be snug enough that they cannot reach it. If your cat is able to bite or chew on the collar, it is too loose. A useful rule of thumb is to allow two-to-three fingers width between the collar and your cat’s neck. Your cat should not be able to get their legs stuck underneath the collar. You may have to monitor your cat for a little while after fitting the collar to check they are comfortable. Airing out a new collar is a good precaution, especially if you are using a collar which contains pesticides. When first opened, flea collars can smell quite potent and may irritate your cat. When you have first fitted a new collar, you should keep an eye on your cat and check their skin over the next few days to ensure there are no adverse reactions. If you have multiple pets with fleas in the home, you must never share flea collars between them. Cats are more sensitive than dogs to flea treatments. Even if the ingredients look the same, those designed for dogs will contain higher amounts which can poison your cat. Always use separate treatments which are specialized for each species of pet you own. When using a flea collar, do not use any other flea treatments on your cat. This can lead to over-medication and potential poisoning. Flea collars are very useful products for dealing with fleas on your cat, but there are some risks and precautions associated with their use. Cats must never be able to lick or chew their collars. This applies whether they contain pesticides or not. Essential oils should also not be ingested as they can make your cat very sick. When choosing a collar, be sure to check the ingredients and research them before deciding. Some chemicals, such as tetrachlorvinphos, are known to be dangerous to humans and pets. Unfortunately, they may still be found in some products available online. Individual risks will vary depending upon the primary chemical used. Pyriproxyfen is considered to be generally low in toxicity to mammals. If it gets into the eyes, it can cause some mild irritation. It does not usually irritate if it comes into contact with the skin. If pyriproxyfen is consumed in high doses, it can cause diarrhea, vomiting, difficulty breathing and problems with muscle control. People who work closely with imidacloprid have reported irritation to the eyes, breathlessness, confusion, and dizziness. This is unlikely to happen from contact with a flea collar. However, it is wise to limit exposure as much as possible. Make sure children do not place their face too close to the flea collar when cuddling your pet. Some cat owners have experienced skin irritation after coming into contact with imidacloprid. If a pet ingests imidacloprid, they may drool, vomit, appear lethargic and have trouble walking. In some cases, cats have had skin reactions to imidacloprid. Amitraz has been classified as a possible carcinogen. Humans who have been exposed to high quantities have suffered respiratory failure. However, this is highly unlikely with household use. Flumethrin has a low toxicity to both humans and other mammalian pets. There is potential for irritation if it gets onto the skin. In some cases, numbness or tingling may occur in the area exposed. If flumethrin gets into the eyes, it can cause tearing, blurred vision and burning. It can also damage the surface of the eye. If it is inhaled, coughing, vomiting and difficulty breathing is possible. Propoxur is most often deeply embedded into the material of a flea collar. Short-term exposure via ingestion can result in nausea, vomiting, blurred vision and headaches. These symptoms rarely last very long. If inhaled over long periods, propoxur can affect liver and bladder function. There have been no studies or classifications regarding the potential carcinogenic effects of propoxur. Children should be kept away from flea collars which contain propoxur. They are most likely to accidentally ingest the chemical should they get it on their hands. Adults should wash hands thoroughly after handling propoxur. There is some concern over the use of this chemical in flea products due to its toxicity. Propoxur flea collars emit the chemical gradually over time, so it may contaminate air if a cat remains indoors. In fact, the Environmental Protection Agency is considering banning propoxur flea collars. Essential oils can be toxic to cats if ingested. Cats are more sensitive to essential oils than dogs or humans. This is because they are missing an enzyme in their liver which metabolizes certain toxins. Symptoms of poisoning by essential oils can vary depending upon the oil consumed. Most often, cats will become wobbly on their feet, vomit and drool. Children should also be kept away from essential oils. Just because they are natural does not mean they are perfectly safe. Children are more vulnerable to toxins than adults, so may experience unexpected reactions. They have thinner skin which can absorb oils more readily, as well as immature livers which can struggle to manage toxins. Symptoms of essential oil poisoning in children can appear between 30 minutes and four hours after exposure. Symptoms include drowsiness, nausea, vomiting and wheezing. In serious cases, seizures can occur. The take away from this is to treat flea collars as the chemical products they are. Handle them with care, wash hands after use, and keep away from children and other animals. You should always follow the directions closely. It is a violation of federal law to use pesticides in a manner inconsistent with their labeling. Fleas are a troublesome and unwelcome addition to your home. Your much-loved kitty will be driven mad by their itchy bites. While flea collars will not eliminate fleas from the home, they will provide rapid relief for your pet in the meantime. Flea collars are available in a variety of formulations. Some are more effective than others, and all have pros and cons. Pesticide flea collars will work rapidly, but tend to carry more risks than natural options. Overall, if used correctly, flea collars are a relatively cheap and convenient option to tackle fleas on your cat.